Anthony Swofford joined the Marine Corps in 1988, setting in motion a series of events that would put him on the front lines of the liberation of Kuwait as part of Operation Desert Storm, and eventually help launch his career as a writer and producer. He’s probably best known for writing the book, “Jarhead” – a very honest memoir of a Marine’s life on and off the battlefield. The book would eventually be released as a major motion picture under the same name in 2005, with Swofford being played by Jake Gyllenhaal. Swofford takes us back to the uneasy days on the “berm” in the desert, and candidly recounts his time at boot camp and going through scout sniper training in the Marine Corps. It’s not often we get the chance to speak with veterans of Desert Storm, especially someone who has done so much with the experience. So sit back, and enjoy this latest episode of HAZARD GROUND, with writer, producer, Marine – Anthony Swofford. We are very excited to announce our newest sponsor, Combat Flip Flops! If you go back into the early HAZARD GROUND archives, we had the founders of Combat Flip Flops, Matt Griffin and Don Lee on Episode 20. Born out of the idea to bring peace to war-torn areas of the world through thriving business, Combat Flip Flops’ mission is to create peaceful, forward-thinking opportunities for self-determined entrepreneurs affected by conflict. Their willingness to take bold risks, community connection, and distinct designs communicate, “Business, Not Bullets”–flipping the view on how wars are won. Through persistence, respect, and creativity, Combat Flip Flops works to empower the mindful consumer to manufacture peace through trade. And now, our listeners will be able to benefit from that mission by getting 15% off every order when you use the coupon code “HAZARD1” at checkout! Do your holiday shopping with us, and give back to veterans organizations at the same time! Go to www.hazardground.com, click on the Amazon banner on the home page, and do your Amazon shopping from there. IT COSTS YOU NOTHING, and it helps the show out tremendously! THE BEST PART IS we’ll be donating proceeds from this partnership to the vet organizations featured on this podcast. So help us out, help out these great organizations, and head over to hazardground.com and click on the Amazon banner today, and shop away! 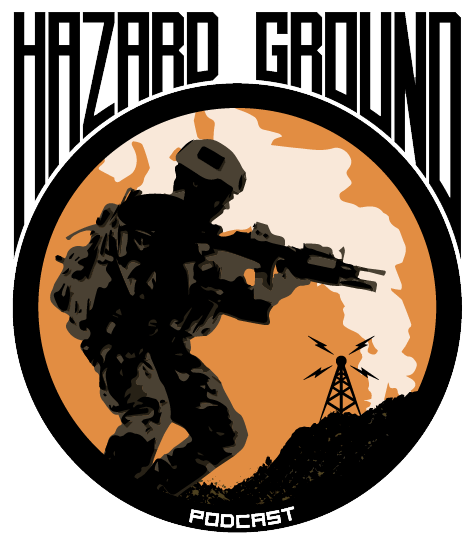 Support the podcast by supporting all of our sponsors at www.hazardground.com/sponsors! Help grow the show! Spread the word, tell a friend!! Subscribe, rate, and review on iTunes!